You will need the FREE RealAudio player to hear these files. Download it here. 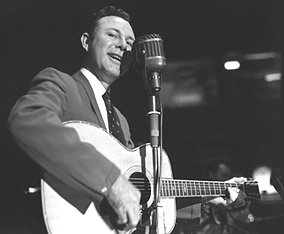 Jim smiling for the camera and having a good time performing on the Saturday night Opry. 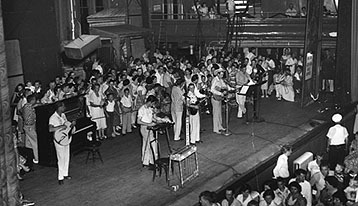 What the Opry stage looked like in the days when Jim was a member. 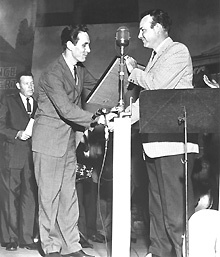 RCA producer Chet Atkins has the honor of presenting Jim Reeves with the prestigious gold record award for "He'll Have To Go" while famed Opry announcer Grant Turner looks on. 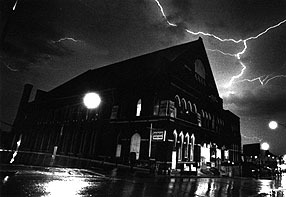 LIVE on the Grand Ole Opry, click the icon above! ©All contents copyright 1998 by Julie Campbell. All worldwide rights reserved. Photos and text may be downloaded from this site for personal use ONLY. All photographs used with exclusive permission of their owners, with signed affadavits on file (at the law offices of Wallentine, O'Toole in Omaha, Nebraska) attesting to this fact. Any re-use of photos/text is strictly prohibited and will constitute violation of copyright, with violators prosecuted to the fullest extent of the law. All performances licensed by Broadcast Music Incorporated (BMI) and used with permission.